One by one, US Capitol Police loaded handcuffed protesters into waiting buses outside Congress. As the crowd chanted “Overturn Citizens United,” one bus filled, then another, then another. By the time the police were done several hours later, more than 400 people had been arrested. The opening day of “Democracy Spring,” which is aimed at eliminating the impact of big money on politics and lowering barriers to voting, was one of the biggest single-day acts of mass civil disobedience ever to occur inside Washington, though it received relatively fleeting mainstream-media attention. But like the movement to stop the Keystone XL pipeline, which began with similar civil disobedience outside the White House, organizers and those arrested are hoping that continued outside pressure can make a difference. 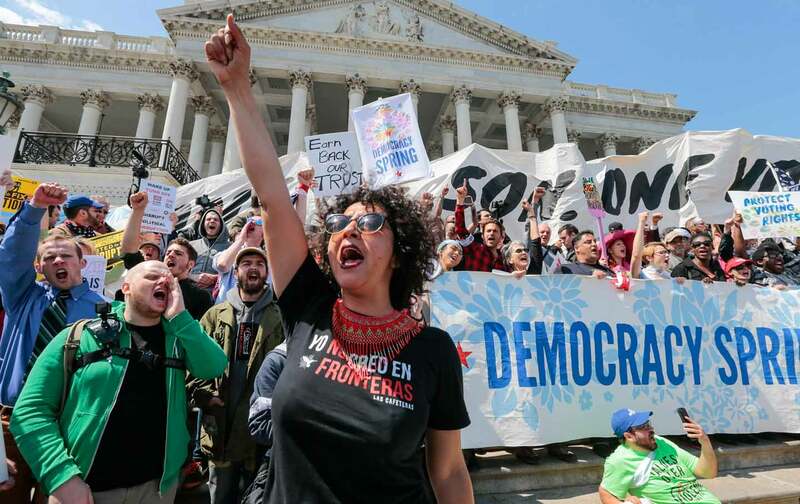 Democracy Spring has planned demonstrations in Washington all week focused around varying themes: labor, environmental justice, racial justice, and youth activism among them. The unifying theme, however, is a restoration of democracy through limiting the influence of money, along with ending voter discrimination. Specifically, the group has identified several steps members of Congress could take immediately to that end, based on bills that have already been introduced: restoring the Voting Rights Act and expanding citizen access to the polls, along with measures to overturn Citizens United and enact public financing of elections. While there were certainly some long-time activists at the event, several people The Nation spoke with were participating in civil disobedience for the first time. Matthew Blair, a student at Georgetown Law, said the protesters were held for about seven hours in a garage-like southeast Washington police facility, though few seemed to mind. Unlike the protests against Keystone, which had a very specific goal in mind, Democracy Spring’s demands are more broad. But organizers aimed to channel voter frustration over money in politics—expressed no doubt, to some degree, in the unexpected successes of both Bernie Sanders and Donald Trump—to highly political but nonpartisan ends. The movement is not supporting any presidential nor congressional candidates. It’s actually the other way around: Newkirk says he hope politicians endorse the movement. Senator Bernie Sanders tweeted some messages of support yesterday, as did Green Party candidate Jill Stein,* though no other candidate has yet acknowledged the movement. The response inside Congress has so far been muted, as well, though the campaign of Representative Chris Van Hollen did respond to a query about the protests from The Nation, which surveyed several members. “The outsized influence of special interests in our democracy is undeniable and unsustainable. But the impact isn’t just limited to election day—it means that the system continues to be rigged in favor of the very wealthy. We must take action to ensure that voices of voters—not corporations—are heard throughout the halls of Congress. And the first steps in achieving that are reversing Citizens United, getting secret special interest money out of our elections, and protecting the right to vote,” he said. *This article has been updated to reflect Jill Stein’s support for Democracy Spring.